This hermeneutical case-study illustrates the complexities of using biblical materials to shed light upon present-day concerns. The specific situation addressed is the recent evangelical controversy regarding gender roles. A significant strand of this debate concerns the relationship between gender and the doctrine of God. This proposition is derived from 1 Corinthians 11. Whilst aspects of this argument are criticized, Lakey also argues that questions of God and gender are related. 1 Corinthians 11:2-16 articulates sexual difference using the metaphysical language of antiquity, thereby situating the sexes vis-à-vis each other as microcosms of God and Christ vis-à-vis the cosmos. For Paul, the Church circumscribes that part of the cosmos able to express its creaturely relationship to God. 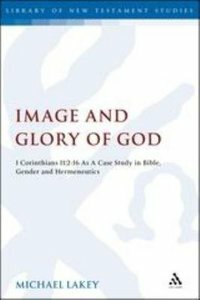 About "Image and Glory of God (Library Of New Testament Studies Series)"
1. Introduction; 2. A Survey Of The Headship Controversy And Its Background; 3. Paul And The Hermeneutics Of The Gender And Trinity Debate; 4. Setting The Exegetical Context: God, Church And World In 1 Corinthians; 5. God, Gender And Cosmological Language In 1 Corinthians 11:2-16; 6. 1 Corinthians 11:2-16: Hermeneutical Problems And Strategies; 7. Conclusion.